The development of rapid approaches for the synthesis of privileged scaffold inspired chemical libraries is a driving force in drug discovery. Phenazines demonstrate a diverse array of biological activities (e.g. anticancer, antibacterial, antifungal, etc.) thus we consider the phenazine heterocycle to be a privileged scaffold of importance to drug discovery. Here, we have developed a synthetic approach that allows for the rapid preparation of four diverse derivatives of phenazine-1-carboxylic acid (PCA) in 3 to 4 linear synthetic steps from a single, commercially available aniline. This step-economy focused approach takes advantage of the Jourdan-Ullmann/sodium borohydride ring-closure pathway to synthesize a diverse set of PCA small molecules, followed by the rapid diversification using Curtius rearrangements and a series of amidation reactions to generate a library of 35 diverse phenazines. Privileged scaffolds have been described as chemotypes that are capable of binding multiple biological targets or compounds that share a particular scaffold and display a diverse array of biological activities [1-4]. For example, indole is considered to be a privileged scaffold as indole-containing compounds are found in many clinically used agents (e.g. oxypertine, medmain) and natural products (e.g. vinblastine, reserpine, okaramine N) . Privileged scaffolds serve as promising lead structures in medicine and have inspired the synthesis of many chemical libraries for target-based and phenotype screens in drug discovery efforts over the past few decades . Phenazine natural products and synthetic small molecules possess an exquisite and diverse array of biological activities [5,6]. For this reason, we consider the phenazine heterocycle 1 (Figure 1) to be a privileged scaffold. Naturally occurring phenazines, such as phenazine-1-carboxylic acid 2, pyocyanin and iodinin, are bacterial metabolites produced by Pseudomonas. Collectively, this class of naturally occurring phenazines is commonly referred to as the “phenazine antibiotics” as a result of their primary function as bacterial warfare agents used in microbial competition . In addition to their antibacterial activity, phenazine small molecules collectively display an array of interesting and therapeutically relevant biological activities, including: general anticancer activity , selective anticancer activity against leukemia cell lines , antifungal activity , fungal antibiofilm activity [10,11] and Pseudomonas. signaling activity [12,13]. Figure 1: Phenazine 1, PCA 2 and PCA derived small molecules 3-5 that demonstrate a diverse array of biological activities against various disease states. Phenazine-1-carboxylic acid (PCA) 2 is one member of the phenazine antibiotics that is produced by Pseudomonas. . The production of 2 in Pseudomonas. chlororaphis subsp. aurantiaca StFRB508 is controlled by multiple N-acylhomoserine lactone governed quorum sensing systems . In Pseudomonas. aeruginosa strain PA14, PCA has been shown to (1) promote bacterial biofilm development through the acquisition of iron  and (2) promote survival via altering the intracellular redox state . The PCA scaffold is a promising lead structure for multiple disease areas and has received much attention for its ability to effectively intercalate DNA resulting in the advancement of PCA dimers to human clinical trials for the treatment of solid tumors (structure 3, Figure 1) [7,17,18]. Additionally, N-aryl and N-heteryl amide analogues of PCA have demonstrated potent antibacterial activity against Mycobacterium tuberculosis H37Rv and drug-resistant strains (minimum inhibitory concentration ranges between 0.19 μg/mL and 0.79 μg/mL; (Structure 4, Figure 1) . Amide analogues of PCA have also demonstrated low nanomolar potency as an antifungal agent against the crop fungus Rhizoctonia solani  (Structure 5, Figure 1). Based on the established biological activities of PCA-based compounds, phenazine-1-carboxylic acid derived small molecules are indeed privileged structures. Considering the diverse array of biomedical applications for PCA-derived small molecules and the lack of phenazine libraries in drug discovery, we became interested in developing a rapid synthetic approach that focused primarily on the diversification of PCA small molecules. Following careful examination of various synthetic approaches to generate diverse PCA analogues, we determined that using the copper-promoted Jourdan-Ullmann reaction between an appropriately functionalized aniline and 2-bromo-3-nitrobenzoic acid followed by reductive ring closure with sodium borohydride would be ideal . We were attracted to this route because of the opportunity to generate highly diverse PCA analogues at the 6-, 7-, 8- and 9-positions of the phenazine heterocycle from commercially available, cost effective aniline building blocks (Figure 2). Figure 2: Modular and step-economic approach to the synthesis of a diverse collection of PCA derived small molecules for discovery. In addition to the rapid synthesis of diverse PCA compounds using the Jourdan-Ullmann/reductive cyclization route, our goals were to further diversify PCA analogues (Figure 2). Functionalization of PCA scaffolds can be accomplished through amide formation. Alternatively, we employed a Curtius rearrangement as a means to transform PCA compounds into novel 1-aminophenazine small molecules, which can additionally serve as starting materials for the synthesis of reverse amide analogues of diverse PCA building blocks. We previously reported the synthesis of a few PCA analogues during investigations that led to the discovery of a series of bromophenazines that demonstrate potent antibacterial activity against the gram-positive human pathogens Staphylococcus aureus and Staphylococcus epidermidis . Here, we report the full details of the development of a rapid synthetic approach that has the potential to yield diverse collections of PCA-derived compounds for biological screening in 3 to 4 synthetic steps from a single, commercially available aniline starting material. The first step in our synthesis of PCA analogues is a copper-promoted Jourdan-Ullmann coupling between 2-bromo-3- nitrobenzoic acid and various aniline starting materials. In previous reports by other groups, the Jourdan-Ullmann coupling between anilines and 2-bromo-3-nitrobenzoic acid has been reported to take between 2 and 48 hours to complete [20,22,23], however, we found that this copper-promoted C-N coupling reaction typically requires 16 to 18 hours. This reaction generally proved to be quite robust on a one gram scale of 2-bromo-3-nitrobenzoic acid and allowed for the successful C-N coupling of 15 diverse anilines that contained a range of functional groups, including: halogen atoms, alkyl, methoxy and ester groups. During our investigations, the yields for the Jourdan-Ullmann coupling reaction ranged between 29-99% with an average yield of 60% to provide compounds 6-20 (Figure 3). Figure 3: Synthetic route to phenazine-1-carboxylic acids involving Jourdan-Ullmann coupling and sodium borohydride reductive ring closure. All Jourdan-Ullmann products (compounds 6-20) and phenazine-1-carboxylic acids (compounds 2, 21-32) have been included with percent yields. Following Jourdan-Ullmann coupling, sodium borohydride was used in a reductive ring closure reaction to form phenazine- 1-carboxylic acids 2 and 21-32 that are either non-functionalized (i.e., PCA 2) or diversely functionalized in the 6-, 7-, 8- and/ or 9-position(s) of the phenazine heterocycle with fluoro-, chloro-, bromo-, alkyl-, methoxy- or carboxylic acid groups. The success rate of this sodium borohydride reductive ring closure was quite good as we were able to synthesize desired PCA analogues (2 and 21-32) from 13 of the 15 (87%) Jourdan-Ullmann substrates (6-20) synthesized. We were unable to obtain the desired PCA compounds from reductive ring closure of compounds 12 and 18. Substrates 12 and 18 surprisingly yielded PCA 2 as the only observed product due to over-reduction. The average yield for successful ring closing reactions was 44% with a large range of yields (between 1 and 84% yield) during our synthesis of PCA analogues 2 and 21-32. Previous sodium borohydride-promoted reductive ring closures of 2-((phenyl)amino)-3-nitrobenzoic acids to form PCA analogues have been reported to require 2 to 24 hours for completion [20,22-24]. In our hands, we found that the optimal reaction time for our reductive ring closure reactions to be ~24 hours (at 60-70°C to reflux in either water or methanol as solvents). Sluggish ring-closure reactions (as determined by TLC analysis of reactions) were most effectively pushed to completion by the portion-wise addition of additional sodium borohydride. We found that 5 to 10 equivalents of sodium borohydride work best for the ring closure of most substrates to their corresponding PCA analogue. 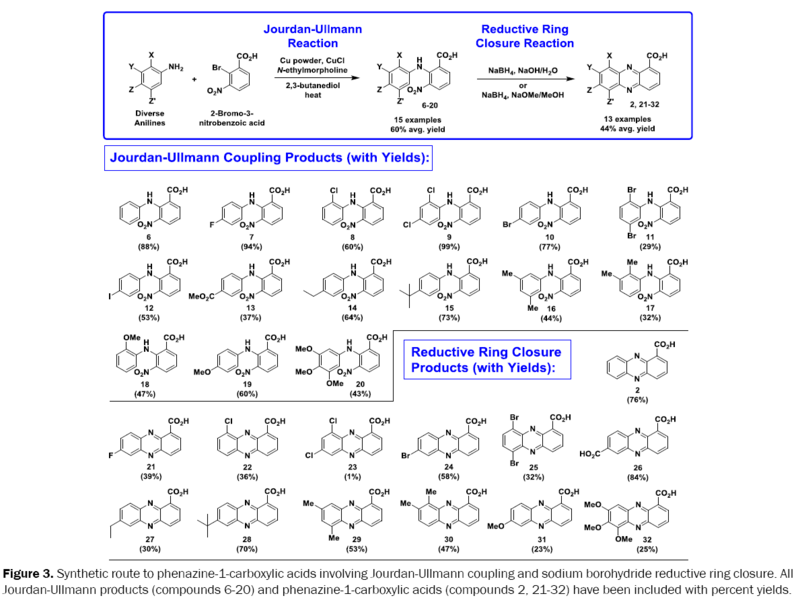 We also noted that product yields for the reductive ring closure reaction were typically diminished upon extended reaction times ( ≥ 36 hours). Interestingly, there are few published 1H and 13C NMR spectra of analogous PCA compounds using this step-economic route [20-24]. Besides our previous report , we found only one reference that provides NMR spectra of two phenazine-1-carboxylic acids which were regiomeric isomers separated from a single sodium borohydride reductive ring closure reaction . The majority of the PCA analogues (i.e., 2, 21-32) we synthesized during the course of these studies proved to be very difficult to purify following previously reported purification procedures, which include: recrystallization, trituration, and alcohol solvent washes. Despite our best efforts, we found that these purification procedures typically produced PCA compounds whose purity was insufficient for assessment in biological assays or screens (<80% purity by 1H NMR analysis; data not shown). Gamage and co-workers did report the use of column chromatography (silica gel) to purify PCA analogues in their studies [23-26], which we also found to be necessary for optimal purity of PCA analogues 2 and 21-32 (see Supplementary Material for 1H and 13C NMR spectra). Following the successful synthesis of PCA analogues 2 and 21-32, our next goal was to make diverse PCA amide analogues. We treated several of our PCA analogues with thionyl chloride in toluene at elevated temperatures which effectively transformed these PCA analogues to the corresponding acid chlorides. Amidation of PCA derived acid chlorides was easily carried out by adding either aqueous ammonia or an aniline starting material to make a focused collection of 10 PCA amides (i.e., compounds 33-42) with an average yield of 59% (Figure 4). Figure 4: SynthetiFc idguivree r4s. iSfiycnathteitoicn d oivfe prshifiecnataiozni nofe p-1he-ncaazrinbeo-1x-yclaircb oaxcyildics a tcoid sm toa mkeak feo fcoucusseedd llibibrarraiersi eosf PoCfA P dCeAri vdeed raimveidde sa (m33i-d42e)s, P(C3A3 -d4er2iv)e, dP CA derived amines (43-50) and PCA reverse amides (51-54). PCA amide small molecules in particular are promising lead structures for the discovery of new anticancer, anti-tuberculosis and antifungal agents. Future studies will include the screening of these diverse PCA-amide structures in various phenotype and target-based screens. 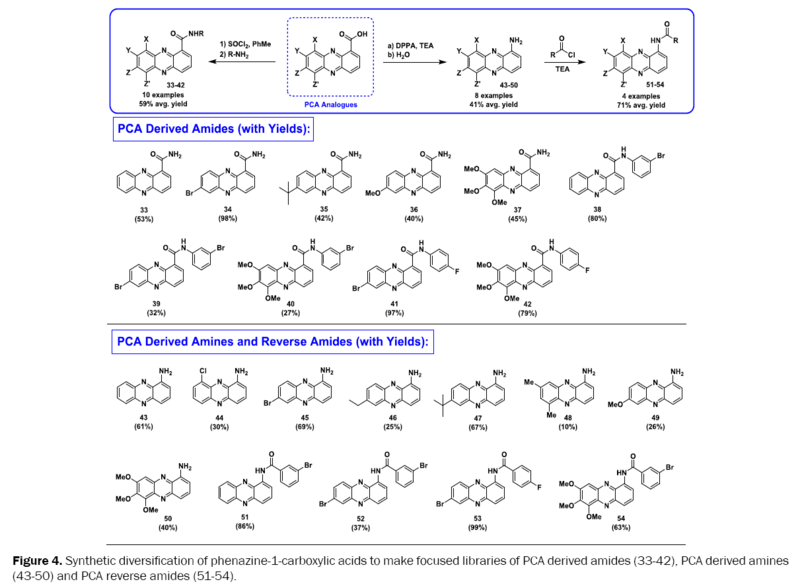 Additionally, PCA-derived amides are ideal for parallel synthesis strategies as (1) several of the phenazine- 1-carboxylic acids we synthesized were scalable to >150 milligrams and (2) we can rapidly synthesize collections of PCA-derived amides from coupling diverse phenazine-1-carboxylic acids with commercially available amines. Further diversification of the PCA scaffold was carried out by reacting diphenylphosphoryl azide (DPPA) with 8 PCA analogues, followed by reaction with water to yield 1-aminophenazine small molecules 43-50 (Figure 4) in one-pot. The average yield for the Curtius rearrangement reaction was 41% in our hands. We also acylated three Curtius products (i.e., 1-aminophenazines 43, 45 and 50) with either 3-bromobenzoyl chloride or 4-fluorobenzoyl chloride to give four PCA reverse amide structures 51-54 in 71% average yield. In conclusion, we have identified phenazine-1-carboxylic acid based small molecules as privileged structures of importance to drug discovery and we report the development of a synthetic approach that yields diverse collections of PCA analogues from a single, commercially available aniline starting material in three to four linear steps. Using this approach, we have rapidly assembled a focused library of 35 PCA-inspired small molecules to drive our discovery programs. Biological screening of this library is currently underway and details from those studies will be reported in due course. All chemical reagents were purchased from commercial sources and used without further purification. Reactions were carried out under an inert atmosphere of argon. Analytical thin layer chromatography (TLC) was performed using 250 μm Silica Gel 60 F254 pre-coated plates (EMD Chemicals Inc.). Flash column chromatography was performed using 230-400 Mesh 60Å Silica Gel (Sorbent Technologies). 1H NMR experiments were recorded on a Varian Mercury-Plus 400 spectrometer (400 MHz). 13C NMR experiments were recorded on a Varian Mercury-Plus 400 spectrometer (100 MHz) and a Bruker Avance-III-500 spectrometer (126 MHz) respectively. Spectra were obtained in the following solvents (with reference peaks for 1H and 13C signals): CDCl3 (1H NMR: 7.26 ppm; 13C NMR: 77.23 ppm), d6-DMSO (1H NMR: 2.50 ppm; 13C NMR: 39.52 ppm), d6-acetone (1H NMR: 2.05 ppm; 13C NMR: 206.68 ppm, 29.84 ppm). NMR samples where the respective solvent peak was buried in the sample signals used TMS as a reference at 0.00 ppm for 1H NMR experiments. NMR experiments were performed at room temperature and spectra are reported using MestReNova 8.1 software. Chemical shift values (δ) are reported in parts per million (ppm) for all 1H NMR and 13C NMR spectra. 1H NMR multiplicities are reported as: s=singlet, d=doublet, t=triplet, q=quartet, m=multiplet, br=broad. High-resolution mass spectra (HRMS) were obtained using an Agilent 6220 ESI-TOF (DART ionization mode) from the Mass Spectrometry facility (Chemistry Department) at the University of Florida. All new compounds are reported in this experimental section with characterization data. To a flame-dried round-bottom flask was sequentially added 2-bromo-3-nitrobenzoic acid (250 mg, 1.02 mmol), copper(I) chloride (10.0 mg, 0.10 mmol), and a catalytic amount of copper powder (3.25 mg, 0.05 mmol). The flask was then purged with argon for 5 minutes before an aniline starting material (1.52 mmol), N-ethylmorpholine (0.26 mL, 2.03 mmol) and 2,3-butanediol (0.63 mL) were added and the resulting reaction mixture was heated to 70°C and stirred for 17 hours (until the reaction was complete as determined by TLC analysis). The reaction was then cooled to room temperature and diluted with 25 mL 0.1N aqueous ammonium hydroxide solution and then filtered over a thin pad of celite. The resulting filtrate was poured slowly into 5 mL of 2N aqueous hydrochloric acid and the resulting precipitate was filtered to yield the title compound, which was used without further purification. NOTE: Analytical samples of a few Jourdan-Ullmann products were purified via column chromatography (using hexanes:ethyl acetate to elute the product) for 1H and 13C NMR spectra. 2-((4-(fluoro)phenyl)amino)-3-nitrobenzoic acid (7): Yellow solid (1.05 g, 94%). 1H NMR: (400 MHz, d6-DMSO) δ 9.85 (s, 1H), 8.19 (dd, J=7.7, 1.6 Hz, 1H), 8.06 (dd, J=7.7, 1.6 Hz, 1H), 7.12 – 7.04 (m, 3H), 7.01 – 6.94 (m, 2H). 13C NMR: (100 MHz, d6-DMSO) δ 168.6, 158.4 (d, J=242 Hz), 139.5 (2), 137.9 (d, J=2.6 Hz), 136.7, 130.9, 120.7 (d, J=8.2 Hz), 120.2, 118.7, 115.8 (d, J=22.6 Hz). HRMS (DART): calc. for C13H10FN2O4 [M+H]+: 275.0481, found: 275.0481. MP: 184-185 °C. 2-((2,4-dichlorophenyl)amino)-3-nitrobenzoic acid (9): Yellow solid (328 mg, 99%). 1H NMR: (400 MHz, d6-DMSO) δ 9.96 (br s, 1H), 8.25 (dd, J=7.8, 1.7 Hz, 1H), 8.15 (dd, J=8.2, 1.7 Hz, 1H), 7.67 (d, J=2.4 Hz, 1H), 7.23 (m, 1H), 7.20 (d, J=8.0 Hz, 1H), 6.86 (d, J=8.7 Hz, 1H). 13C NMR: (100 MHz, d6-DMSO) δ 169.0, 140.2, 138.3, 137.9, 137.3, 131.3, 129.8, 128.1, 127.4, 125.5, 121.7, 120.9, 118.7. HRMS (DART): calc. for C13H9Cl2N2O4 [M+H]+: 325.9772, found: 325.9774. MP: 211-212 °C. 4.2.3. 2-((4-iodophenyl)amino)-3-nitrobenzoic acid (12): Yellow solid (833 mg, 53%). 1H NMR: (400 MHz, d6-acetone) δ 12.01 (br s, 1H), 9.96 (s, 1H), 8.34 (dd, J=7.8, 1.7 Hz, 1H), 8.11 (dd, J=8.2, 1.7 Hz, 1H), 7.68 – 7.51 (m, 2H), 7.16 (t, J=8.0 Hz, 1H), 6.87 – 6.79 (m, 2H). 13C NMR: (100 MHz, d6-acetone) δ 169.1, 142.6, 141.1, 140.2, 138.9, 137.7, 132.1, 121.7, 120.5, 119.9, 86.5. HRMS (DART): calc. for C26H16I2N4O8Na [2(M-H)+Na]-: 788.8955, found: 788.8977. MP: 188-189 °C. 4.2.4. 2-((4-(methoxycarbonyl)phenyl)amino)-3-nitrobenzoic acid (13): Yellow solid (478 mg, 37%). 1H NMR: (400 MHz, d6- DMSO): δ 13.68 (br s, 1H), 9.57 (s, 1H), 8.16 (ddd, J=9.9, 8.0, 1.6 Hz, 2H), 7.82 – 7.74 (m, 2H), 7.33 (t, J=8.0 Hz, 1H), 6.93 – 6.83 (m, 2H), 3.79 (s, 3H). 13C NMR: (100 MHz, d6-DMSO): δ 167.6, 165.9, 147.6, 143.0, 136.2, 135.5, 130.8, 129.8, 125.5, 122.6, 121.9, 115.6, 51.8. HRMS (DART): calc. for C15H13N2O6 [M+H]+: 317.0768, found: 317.0766. MP: 199-201 °C. 2-((4-(tert-butyl)phenyl)amino)-3-nitrobenzoic acid (15): Yellow solid (937 mg, 73%). 1H NMR: (400 MHz, d6-DMSO) δ 9.91 (br s, 1H), 8.21 (dd, J=7.8, 1.7 Hz, 1H), 8.07 (dd, J=8.1, 1.7 Hz, 1H), 7.25 (m, 2H), 7.07 (t, J=8.0 Hz, 1H), 6.84 (m, 2H), 1.24 (s, 9H). 13C NMR: (100 MHz, d6-DMSO) δ 168.7, 145.6, 139.5, 139.1, 138.8, 136.8, 130.9, 125.8, 120.1, 118.6, 117.7, 34.0, 31.2. HRMS (DART): calc. for C17H19N2O4 [M+H]+: 315.1339, found: 315.1340. MP: 199-201 °C. 2-((3,5-dimethylphenyl)amino)-3-nitrobenzoic acid (16): Yellow solid (513 mg, 44%). 1H NMR: (400 MHz, d6-DMSO) δ 13.78 (br s, 1H), 9.85 (s, 1H), 8.19 (dd, J=7.8, 1.7 Hz, 1H), 8.05 (dd, J=8.1, 1.7 Hz, 1H), 7.07 (t, J=8.0 Hz, 1H), 6.64 (s, 1H), 6.52 (s, 2H), 2.16 (s, 6H). 13C NMR: (100 MHz, d6-DMSO) δ 168.7, 141.0, 139.8, 138.8, 138.3, 136.6, 130.8, 125.0, 120.0, 118.6, 115.7, 20.9. HRMS (DART): calc. for C15H15N2O4 [M+H]+: 285.0888, found: 285.0888. MP: 221-222 °C. 2-((2,3-dimethylphenyl)amino)-3-nitrobenzoic acid (17): Yellow solid (373 mg, 32%). 1H NMR: (400 MHz, d6-DMSO) δ 9.88 (s, 1H), 8.21 (dd, J=7.8, 1.7 Hz, 1H), 8.01 (dd, J=8.1, 1.7 Hz, 1H), 7.00 (t, J=8.0 Hz, 1H), 6.93 – 6.86 (m, 2H), 6.59 (t, J=4.6 Hz, 1H), 2.27 (s, 3H), 2.20 (s, 3H). 13C NMR: (100 MHz, d6-DMSO) δ 169.1, 141.0, 139.5, 138.8, 137.6, 136.7, 131.1, 128.6, 126.0, 125.6, 118.6, 117.5, 115.6, 20.2, 13.6. HRMS (DART): calc. for C15H15N2O4 [M+H]+: 285.0888, found: 285.0888. MP: 204-205 °C, lit 206 °C . A 2-((Phenyl)amino)-3-nitrobenzoic acid starting material (0.61 mmol) was dissolved in 15 mL aqueous 2N sodium hydroxide and treated with sodium borohydride (139 mg, 3.67 mmol). The resulting reaction mixture was heated to 70 °C and allowed to stir until starting material was consumed (reaction monitored by TLC analysis). Upon the completion of the reaction, the contents in the reaction flask were poured into ice, quenched with 3 mL 2N aqueous hydrochloric acid, and extracted with dichloromethane 3x50 mL. The pooled organic layers were washed with brine, dried over sodium sulfate, and concentrated via rotovap. The crude mixture was adsorbed onto silica gel using dichloromethane (then dried via rotovap) and chromatographed using dichloromethane or hexane:ethyl acetate to deliver the respective PCA product. Sodium hydride (960 mg, 24.0 mmol) was added in portions to 6 mL of methanol at 0 °C (4M NaOMe solution) before a 2-((Phenyl)amino)-3-nitrobenzoic acid starting material (0.32 mmol) was added followed by sodium borohydride (120 mg, 3.2 mmol). The reaction was then heated to reflux and allowed to stir until the completion of the reaction (as determined by TLC analysis). After the completion of the reaction, the mixture was cooled to 5 °C and the crude product was filtered, then washed with cold methanol. The product was then purified by column chromatography using dichloromethane:methanol to elute the respective PCA product. 7-fluorophenazine-1-carboxylic acid (21): Yellow solid (34.1 mg, 39%; Procedure A). 1H NMR: (400 MHz, d6-DMSO) δ 14.21 (s, 1H), 8.52 (m, 1H), 8.49 – 8.43 (m, 2H), 8.14 – 8.06 (m, 2H), 8.04 (m, 1H). 13C NMR: (100 MHz, d6-DMSO) δ 166.6, 163.1 (d, J=249 Hz), 143.6, 142.7, 139.3, 138.9, 133.2, 132.8, 131.9 (d, J=10.7 Hz), 131.1, 129.6, 124.4 (d, J=28.5 Hz), 111.5 (d, J=21.2 Hz). HRMS (DART): calc. for C13H8FN2O2 [M+H]+: 243.0564, found: 243.0564. MP: >250 °C. 7,9-dichlorophenazine-1-carboxylic acid (23): Yellow solid (2.5 mg, 1%; Procedure A). 1H NMR: (400 MHz, CDCl3) δ 15.08 (s, 1H), 9.04 (d, J=7.2 Hz, 1H), 8.53 (d, J=8.7 Hz, 1H), 8.30 (s, 1H), 8.18 – 8.01 (m, 2H). 13C NMR: (100 MHz, CDCl3) δ 165.4, 144.4, 144.1, 139.9, 138.6, 137.5, 135.8, 134.9, 133.3, 133.1, 132.1, 127.6, 125.6. HRMS (DART): calc. for C13H7Cl2N2O2 [M+H]+: 292.9879, found: 292.9881. MP: >250 °C. phenazine-1,7-dicarboxylic acid (26): Yellow solid (304 mg, 84%; Procedure A). 1H NMR: (400 MHz, d6-DMSO) δ 8.73 (s, 1H), 8.55 – 8.44 (m, 2H), 8.42 (dd, J=9.1, 1.7 Hz, 1H), 8.37 (d, J=9.0 Hz, 1H), 8.08 (dd, J=8.7, 7.0 Hz, 1H). 13C NMR: (126 MHz, d6-DMSO) δ 172.0, 166.7, 166.6, 143.1, 142.6, 142.0, 140.3, 133.9, 133.1, 131.6, 130.9, 130.8, 130.0, 128.9. HRMS (DART): calc. for C14H9N2O4 [M+H]+: 269.0557, found: 269.0551. MP: >250 °C. 7-(tert-butyl)phenazine-1-carboxylic acid (28): Yellow solid (62 mg, 70%; Procedure B). 1H NMR: (400 MHz, CDCl3) δ 8.87 (m, 1H), 8.43 (m, 1H), 8.17 – 8.11 (m, 2H), 8.08 (dd, J=9.2, 2.0 Hz, 1H), 7.97 (m, 1H), 1.49 (s, 9H). 13C NMR: (100 MHz, CDCl3) δ 166.2, 155.7, 144.4, 143.4, 139.7, 138.8, 136.8, 135.0, 133.4, 130.2, 127.3, 124.9, 124.4, 35.9, 30.8. HRMS (DART): calc. for C17H17N2O2 [M+H]+: 281.1285, found: 281.1281. MP: 200-201 °C. 6,8-dimethylphenazine-1-carboxylic acid (29): Yellow solid (189 mg, 53%; Procedure A). 1H NMR: (400 MHz, CDCl3) δ 15.87 (s, 1H), 8.92 (dd, J=7.2, 1.4 Hz, 1H), 8.53 (dd, J=8.7, 1.3 Hz, 1H), 7.97 (dd, J=8.0, 1.5 Hz, 1H), 7.85 (s, 1H), 7.61 (s, 1H), 2.91 (s, 3H), 2.65 (s, 3H). 13C NMR: (100 MHz, CDCl3) δ 166.6, 144.9, 142.9, 142.1, 140.4, 139.8, 138.2, 136.9, 135.6, 134.0, 129.3, 124.7, 124.0, 22.8, 17.6. HRMS (DART): calc. for C15H13N2O2 [M+H]+: 253.0972, found: 253.0972. MP: 249 °C (decomposed). 8,9-dimethylphenazine-1-carboxylic acid (30): Yellow solid (41 mg, 47%; Procedure B). 1H NMR: (400 MHz, CDCl3) δ 8.90 (d, J=7.1 Hz, 1H), 8.45 (d, J=8.7 Hz, 1H), 8.12 – 7.89 (m, 2H), 7.74 (d, J=8.9 Hz, 1H), 2.78 (s, 3H), 2.64 (s, 3H). 13C NMR: (100 MHz, CDCl3) δ 166.4, 143.4, 142.3, 141.7, 139.6, 139.2, 137.0, 136.0, 134.9, 132.2, 129.8, 127.1, 124.8, 21.3, 13.8. HRMS (DART): calc. for C15H13N2O2 [M+H]+: 253.0972, found: 253.0971. MP: 240 °C (decomposed). To a phenazine-1-carboxylic acid (0.16 mmol) starting material dissolved in 2.0 mL toluene was added thionyl chloride (57 μL, 0.79 mmol) at room temperature. The resulting reaction mixture was heated to 65 °C for 3 hours before being concentrated via rotovap. The crude acid chloride was taken up in 2.0 mL dichloromethane and 0.2 mL 30% aqueous ammonia was added resulting in an immediate precipitation of a yellow solid. Stirring was continued overnight and the reaction was then filtered and washed with cold dichloromethane. The crude product was eluted over a short plug of silica gel with ethyl acetate and concentrated to yield the pure corresponding primary amide. To a phenazine-1-carboxylic acid (0.16 mmol) starting material dissolved in 2.0 mL toluene was added thionyl chloride (57 μL, 0.79 mmol) at room temperature. The resulting reaction mixture was heated to 65 °C for 3 hours before being concentrated via rotovap. The crude acid chloride was taken up in 2.0 mL dichloromethane and the corresponding primary amine/aniline was added (0.32 mmol) and a yellow precipitate immediately formed. The reaction was allowed to stir overnight before being diluted in ethyl acetate and washed with 2N aqueous hydrochloric acid, followed by aqueous sodium bicarbonate and finally brine. The organic layers were combined, dried with sodium sulfate and concentrated to give the crude product. The amides were then purified via column chromatography using hexane:ethyl acetate to elute pure secondary amides. 7-(tert-butyl)phenazine-1-carboxamide (35): Yellow solid (5.2 mg, 42%; Procedure A). 1H NMR: (400 MHz, CDCl3) δ 10.76 (br s, 1H), 8.98 (dd, J=7.2, 1.6 Hz, 1H), 8.40 (dd, J=8.7, 1.6 Hz, 1H), 8.23 – 8.09 (m, 2H), 8.02 (dd, J=9.3, 2.1 Hz, 1H), 7.94 (dd, J=8.7, 7.1 Hz, 1H), 6.38 (br s, 1H), 1.50 (s, 9H). 13C NMR: (100 MHz, CDCl3) δ 166.9, 154.9, 143.7, 143.5, 140.7, 140.6, 135.5, 134.3, 131.9, 129.9, 129.0, 128.6, 124.2, 35.8, 30.9. HRMS (DART): calc. for C17H18N3O [M+H]+: 280.1444, found: 280.1448. MP: >250 °C. 7-methoxyphenazine-1-carboxamide (36): Yellow solid (16.0 mg, 40%; Procedure A). 1H NMR: (400 MHz, d6-DMSO) δ 9.71 (br s, 1H), 8.58 (dd, J=7.1, 1.5 Hz, 1H), 8.33 (dd, J=8.6, 1.5 Hz, 1H), 8.30 (d, J=9.5 Hz, 1H), 8.10 – 7.97 (m, 2H), 7.71 (dd, J=9.5, 2.8 Hz, 1H), 7.55 (d, J=2.8 Hz, 1H), 4.04 (s, 3H). 13C NMR: (100 MHz, d6-DMSO) δ 165.8, 161.4, 144.4, 142.7, 138.6, 138.5, 132.5, 132.4, 130.9, 130.6, 130.2, 127.5, 104.5, 56.3. HRMS (DART): calc. for C14H12N3O2 [M+H]+: 254.0924, found: 254.0928. MP: >250°C. 6,7,8-trimethoxyphenazine-1-carboxamide (37). Yellow solid (1.8 mg, 45%; Procedure A). 1H NMR: (400 MHz, CDCl3) δ 10.76 (br s, 1H), 8.93 (dt, J=7.2, 1.3 Hz, 1H), 8.47 (dt, J=8.7, 1.3 Hz, 1H), 7.87 (ddd, J=8.4, 7.2, 1.0 Hz, 1H), 7.20 (s, 1H), 6.28 (br s, 1H), 4.28 (s, 3H), 4.18 (s, 3H), 4.13 (s, 3H). 13C NMR: (100 MHz, CDCl3) δ 167.2, 158.6, 145.6, 145.5, 141.4, 140.7, 140.2, 137.2, 135.4, 134.7, 128.5, 128.1, 101.0, 62.8, 62.0, 56.8. HRMS (DART): calc. for C16H16N3O4 [M+H]+: 314.1135, found: 314.1139. MP: 245 °C (decomposed). N-(3-bromophenyl)-7-bromo-phenazine-1-carboxamide (39): Yellow solid (24.0 mg, 32%; Procedure B). 1H NMR: (400 MHz, CDCl3) δ 13.11 (s, 1H), 9.04 (m, 1H), 8.50 (m, 1H), 8.40 (m, 1H), 8.14 (m, 1H), 8.10 (m, 1H), 8.05 – 7.97 (m, 2H), 7.77 (m, 1H), 7.33 – 7.27 (m, 2H). 13C NMR: (100 MHz, CDCl3) δ 162.6, 144.1, 143.6, 140.6, 140.2, 139.7, 136.8, 136.2, 134.6, 132.1, 131.1, 130.6, 130.1, 129.0, 127.6, 126.1, 123.6, 123.0, 119.2. HRMS (DART): calc. for C19H12Br2N3O [M+H]+: 457.9322, found: 457.9331. MP: 240-242 °C. N-(3-bromophenyl)-6,7,8-trimethoxyphenazine-1-carboxamide (40): Yellow solid (21.1 mg, 27%; Procedure B). 1H NMR: (400 MHz, CDCl3) δ 13.39 (s, 1H), 8.98 (dd, J=7.2, 1.2 Hz, 1H), 8.48 (dd, J=8.7, 1.2 Hz, 1H), 8.18 (m, 1H), 7.90 (dd, J=7.1, 1.3 Hz, 1H), 7.77 (m, 1H), 7.33 – 7.28 (m, 2H), 7.17 (s, 1H), 4.30 (s, 3H), 4.20 (s, 3H), 4.19 (s, 3H). 13C NMR: (100 MHz, CDCl3) δ 163.3, 159.0, 145.7, 145.6, 141.3, 140.4, 140.1, 139.7, 137.3, 135.4, 134.8, 130.5, 128.7, 127.8, 127.3, 123.8, 123.0, 119.2, 100.3, 62.8, 62.0, 56.9. HRMS (DART): calc. for C22H19BrN3O4 [M+H]+: 468.0553, found: 470.0536. MP: 230 °C (decomposed). N-(4-fluorophenyl)-7-bromo-phenazine-1-carboxamide (41): Yellow solid (101 mg, 97%; Procedure B). 1H NMR: (400 MHz, CDCl3) δ 13.03 (s, 1H), 9.06 (dd, J=7.2, 1.5 Hz, 1H), 8.49 (d, J=2.0 Hz, 1H), 8.39 (dd, J=8.7, 1.5 Hz, 1H), 8.10 (d, J=9.2 Hz, 1H), 8.05 – 7.96 (m, 2H), 7.92 – 7.80 (m, 2H), 7.19 – 7.08 (m, 2H). 13C NMR: (100 MHz, CDCl3) δ 162.4, 159.7 (d, J=245 Hz), 144.1, 143.5, 140.6, 139.7, 136.6, 136.1, 135.0 (d, J=3.0 Hz), 134.4, 132.1, 131.1, 130.0, 129.2, 126.0, 122.3 (d, J=7.6 Hz), 116.0 (d, J=22.2 Hz). HRMS (DART): calc. for C19H12BrFN3O [M+H]+: 396.0142, found: 396.0131. MP: 218-220 °C. N-(4-fluorophenyl)-6,7,8-trimethoxyphenazine-1-carboxamide (42): Yellow solid (15.0 mg, 79%; Procedure B). 1H NMR: (400 MHz, CDCl3) δ 13.23 (s, 1H), 8.98 (dd, J=7.3, 1.6 Hz, 1H), 8.46 (dd, J=8.6, 1.6 Hz, 1H), 7.92 – 7.81 (m, 3H), 7.17 – 7.09 (m, 3H), 4.30 (s, 3H), 4.19 (s, 3H), 4.17 (s, 3H). 13C NMR: (100 MHz, CDCl3) δ 163.2, 159.5 (d, J=239 Hz), 158.9, 145.6, 145.5, 141.3, 140.1, 139.7, 137.2, 135.3, 135.2 (d, J=2.6 Hz), 134.6, 128.7, 128.0, 122.4 (d, J=7.9 Hz), 115.9 (d, J=23.3 Hz), 100.3, 62.8, 62.0, 56.9. HRMS (DART): calc. for C22H19FN3O4 [M+H]+: 408.1354, found: 408.1367. MP: 215-216 °C. To a stirring solution of phenazine-1-carboxylic acid (0.058 mmol) starting material dissolved in 1.0 mL of a 10:1 tetrahydrofuran:triethylamine (TEA) solution was added diphenylphosphoryl azide (DPPA; 13 μL, 0.064 mmol). The resulting reaction mixture was allowed to stir for 2.5 hours before 0.2 mL deionized water was added and the resulting reaction mixture was allowed to reflux for an additional 2 hours. After this time, the reaction was allowed to cool to room temperature before being diluted with dichloromethane. This dichloromethane solution was washed with brine, dried with sodium sulfate and concentrated under reduced pressure. The crude material was then purified via column chromatography using hexanes:ethyl acetate to yield the corresponding 1-aminophenazine product. 9-chlorophenazin-1-amine (44): Red solid (4.0 mg, 30%). 1H NMR: (400 MHz, CDCl3) δ 8.14 (dd, J=8.8, 1.1 Hz, 1H), 7.89 (dd, J=7.3, 1.3 Hz, 1H), 7.76 – 7.65 (m, 2H), 7.56 (dd, J=8.8, 1.1 Hz, 1H), 6.96 (dd, J=7.4, 1.1 Hz, 1H), 5.32 (br s, 2H). 13C NMR: (100 MHz, CDCl3) δ 144.6, 144.5, 144.4, 137.8, 135.0, 133.5, 133.3, 130.0, 129.1, 128.8, 116.9, 108.2. HRMS (DART): calc. for C12H9ClN3 [M+H]+: 230.0480, found: 230.0484. MP: 169-170 °C. 7-ethylphenazin-1-amine (46): Purple solid (6.7 mg, 25%). 1H NMR: (400 MHz, CDCl3) δ 8.11 (d, J=8.9 Hz, 1H), 7.98 (s, 1H), 7.67 – 7.58 (m, 2H), 7.55 (dd, J=8.8, 1.4 Hz, 1H), 6.90 (dd, J=7.3, 1.4 Hz, 1H), 2.94 (q, J=7.5 Hz, 2H), 1.41 (t, J=7.6 Hz, 3H). 13C NMR: (100 MHz, CDCl3) δ 147.4, 144.2, 144.0 (2), 140.4, 134.9, 132.1, 131.9, 129.4, 126.0, 117.2, 107.6, 29.4, 14.8. HRMS (DART): calc. for C14H14N3 [M+H]+: 224.1182, found: 224.1186. MP: 105-107 °C. 7-(tert-butyl)phenazin-1-amine (47): Purple solid (10.8 mg, 67%). 1H NMR: (400 MHz, CDCl3) δ 8.19 – 8.06 (m, 2H), 7.87 (dd, J=9.1, 2.1 Hz, 1H), 7.61 (dd, J=8.7, 7.2 Hz, 1H), 7.55 (dd, J=8.8, 1.4 Hz, 1H), 6.90 (dd, J=7.3, 1.3 Hz, 1H), 5.18 (br s, 2H), 1.48 (s, 9H). 13C NMR: (100 MHz, CDCl3) δ 154.0, 144.2 (2), 143.9, 140.2, 135.1, 132.0, 129.5, 129.1, 123.8, 117.2, 107.7, 35.7, 31.0. HRMS (DART): calc. for C16H18N3 [M+H]+: 252.1495, found: 252.1499. MP: 191-193 °C. 6,8-dimethylphenazin-1-amine (48): Red solid (4.4 mg, 10%). 1H NMR: (400 MHz, CDCl3) δ 7.80 (s, 1H), 7.64 – 7.54 (m, 2H), 7.47 (s, 1H), 6.92 (dd, J=6.5, 2.0 Hz, 1H), 2.87 (s, 3H), 2.58 (s, 3H). 13C NMR: (100 MHz, CDCl3) δ 143.9, 143.2, 142.5, 141.8, 140.0, 137.2, 134.9, 132.7, 130.9, 125.9, 118.1, 107.9, 22.4, 17.8. HRMS (DART): calc. for C14H14N3 [M+H]+: 224.1182, found: 224.1185. MP: 170-172 °C. 7-methoxyphenazin-1-amine (49): Red solid (10.0 mg, 26%). 1H NMR: (400 MHz, CDCl3) δ 8.04 (d, J=9.4 Hz, 1H), 7.60 (m, 1H), 7.48 (d, J=8.8 Hz, 1H), 7.43 (dd, J=9.2, 2.8 Hz, 1H), 7.38 (d, J=2.7 Hz, 1H), 6.87 (d, J=7.4 Hz, 1H), 5.18 (br s, 2H), 4.00 (s, 3H). 13C NMR: (100 MHz, CDCl3) δ 161.5, 145.4, 144.4, 144.1, 138.5, 133.6, 132.2, 130.9, 125.4, 116.8, 107.3, 104.6, 56.1. HRMS (DART): calc. for C13H12N3O [M+H]+: 226.0975, found: 226.0979. MP: 167-168 °C, lit. 168-171 °C . 6,7,8-trimethoxyphenazin-1-amine (50): Red gum (4.0 mg, 40%). 1H NMR: (400 MHz, CDCl3) δ 7.66 (dd, J=8.7, 1.2 Hz, 1H), 7.55 (dd, J=8.7, 7.3 Hz, 1H), 6.92 (dd, J=7.4, 1.2 Hz, 1H), 4.25 (s, 3H), 4.14 (s, 3H), 4.08 (s, 3H). (NOTE: One aromatic proton signal is absent in our 1H NMR spectra and most likely buried under our CDCl3 reference peak.) 13C NMR: (100 MHz, CDCl3) δ 156.7, 145.6, 145.3, 143.4, 142.0, 139.9, 137.4, 134.0, 130.5, 118.1, 108.5, 101.6, 62.6, 61.9, 56.6. HRMS (DART): calc. for C15H16N3O3 [M+H]+: 286.1186, found: 286.1193. To a stirring solution of 1-aminophenazine starting material (0.20 mmol) in dichloromethane was added triethylamine (56 μL, 0.40 mmol) and then the respective acid chloride (1.2 equivalents, 0.24 mmol). The resulting reaction mixture was allowed to stir for one hour at room temperature before being diluted with ethyl acetate and washed successively (in separatory funnel) with 2N aqueous hydrochloric acid, followed by brine, saturated sodium bicarbonate and finally brine. The organic layer was then collected, dried with sodium sulfate and concentrated via rotovap. The crude material was subjected to column chromatography using hexanes:ethyl acetate to afford pure reverse amide analogues. 3-bromo-N-(phenazin-1-yl)benzamide (51): Yellow solid (33.0 mg, 86%). 1H NMR: (400 MHz, CDCl3) δ 10.61 (br s, 1H), 8.92 (dd, J=7.5, 1.4 Hz, 1H), 8.34 – 8.20 (m, 3H), 8.02 (dt, J=7.8, 1.4 Hz, 1H), 7.96 (dd, J=9.0, 1.3 Hz, 1H), 7.91 – 7.81 (m, 3H), 7.76 (m, 1H), 7.47 (t, J=7.9 Hz, 1H). 13C NMR: (100 MHz, CDCl3) δ 164.0, 144.0, 143.3, 141.2, 136.9, 135.2, 134.8, 133.9, 131.7, 131.0, 130.9 (2), 130.6, 129.8, 129.4, 125.8, 123.8, 123.4, 116.4. HRMS (DART): calc. for C19H13BrN3O [M+H]+: 378.0236, found: 378.0240. MP: 179-180 °C. 3-bromo-N-(7-bromophenazin-1-yl)benzamide (52): Yellow solid (34.0 mg, 37%). 1H NMR: (400 MHz, CDCl3) δ 10.55 (s, 1H), 8.98 (dd, J=7.1, 1.5 Hz, 1H), 8.50 (dd, J=2.2, 0.5 Hz, 1H), 8.26 (t, J=1.8 Hz, 1H), 8.17 (dd, J=9.2, 0.5 Hz, 1H), 8.03 (ddd, J=7.7, 1.8, 1.0 Hz, 1H), 7.99 – 7.89 (m, 3H), 7.77 (ddd, J=7.9, 1.9, 0.9 Hz, 1H), 7.49 (t, J=7.9 Hz, 1H). 13C NMR: (100 MHz, CDCl3) δ 164.3, 144.3, 143.8, 139.9, 136.9, 135.4, 135.1, 134.8, 134.2, 132.7, 131.9, 130.9, 130.7 (2), 125.9, 125.6, 123.9, 123.5, 116.9. HRMS (DART): calc. for C19H13Br2N3O [M+H]+: 457.9322, found: 457.9344. MP: 237-238 °C. 3-fluoro-N-(7-bromo-phenazin-1-yl)benzamide (53): Yellow solid (44.0 mg, 99%). 1H NMR: (400 MHz, CDCl3) δ 10.50 (s, 1H), 8.95 (ddd, J=6.9, 1.8, 0.8 Hz, 1H), 8.46 (dt, J=2.1, 0.6 Hz, 1H), 8.16 – 8.11 (m, 2H), 8.10 (m, 1H), 7.95 – 7.90 (m, 2H), 7.88 (m, 1H), 7.32 – 7.25 (m, 2H). 13C NMR: (100 MHz, CDCl3) δ 165.4 (d, J=251 Hz), 164.6, 144.3, 143.7, 139.8, 135.0, 134.6, 134.3, 132.7, 131.9, 131.2 (d, J=3.0 Hz), 130.7, 129.9 (d, J=9.3 Hz), 125.5, 123.6, 116.5 (d, J=23.6 Hz), 116.2. HRMS (DART): calc. for C19H13BrN3O [M+H]+: 396.0142, found: 396.0128. MP: 214-215 °C. 3-bromo-N-(6,7,8-trimethoxyphenazin-1-yl)benzamide (54): Yellow solid (5.5 mg, 63%). 1H NMR: (400 MHz, CDCl3) δ 10.52 (s, 1H), 8.91 (dd, J=7.6, 1.2 Hz, 1H), 8.26 (t, J=1.8 Hz, 1H), 8.07 – 8.00 (m, 2H), 7.80 (dd, J=8.8, 7.6 Hz, 1H) 7.76 (m, 1H), 7.48 (t, J=7.9 Hz, 1H), 4.28 (s, 3H), 4.18 (s, 3H), 4.14 (s, 3H). (NOTE: One aromatic proton signal is absent in our 1H NMR spectrum and most likely buried under the residual CHCl3 resonance.) 13C NMR: (100 MHz, CDCl3) δ 164.3, 157.7, 145.7, 145.5, 141.1, 140.2, 137.9, 137.4, 135.2, 134.0, 133.4, 131.0, 130.6, 130.0, 125.9, 124.3, 123.4, 116.5, 101.4, 62.7, 62.0, 56.8. HRMS (DART): calc. for C22H19BrN3O4 [M+H]+: 470.0536, found: 470.0546. MP: 228-229 °C. We would like to acknowledge the College of Pharmacy and Division of Sponsored Research (UF Opportunity Seed Fund Award) at the University of Florida for financially supporting this work. We would like to acknowledge the National Science Foundation through the National High Magnetic Field Laboratory, which supported our NMR studies, in part, at the Advanced Magnetic Resonance Imaging and Spectroscopy (AMRIS) Facility in the McKnight Brain Institute of the University of Florida. Welsch ME, et al. Privileged Scaffolds for Library Design and Drug Discovery. Curr Opin Chem Biol 2010:14: 347-361. Duarte CD, et al. Privileged structures: a useful concept for the rational design of new lead drug candidates. Mini Rev Med Chem 2007:7: 1108-1119. DeSimone RW, Privileged structures: applications in drug discovery. Comb Chem High Through Screen 2004:7: 473-494. Costantino L and Barlocco D. Privileged structures as leads in medicinal chemistry. Curr Med Chem 2006:13: 65-85. Price-Whelan A, et al. Rethinking 'secondary' metabolism: physiological roles for phenazine antibiotics. Nat Chem Biol 2006:2: 71-78. Laursen JB, et al. Phenazine natural products: biosynthesis, synthetic analogues, and biological activity. J Chem Rev 2004:104: 1663-1685. Cimmino A, et al. Phenazines and cancer. Nat Prod Rep 2012:29: 487-501. Myhren LE, et al. Iodinin (1,6-Dihydroxyphenazine 5,10-Dioxide) from Streptosporangium sp. Induces Apoptosis Selectively in Myeloid Leukemia Cell Lines and Patient Cells. Mar Drugs 2013:11: 332-349. Ye L, et al. Phenazine-1-carboxylic acid derivatives: Design, synthesis and biological evaluation against Rhizoctonia solani Kuhn. Bioorg Med Chem Lett 2010:20: 7369-7371. Morales DK, et al. Antifungal mechanisms by which a novel Pseudomonas aeruginosa phenazine toxin kills Candida albicans in biofilms. Mol Microbiol 2010:78: 1379-92. Morales DK, et al. Control of Candida albicans Metabolism and Biofilm Formation by Pseudomonas aeruginosa Phenazines. MBio 2013:4: e00526-12. Dietrich LEP, et al. The phenazine pyocyanin is a terminal signalling factor in the quorum sensing network of Pseudomonas aeruginosa. Mol Microbiol 2006:61: 1308-1321. Jimenez PN The multiple signaling systems regulating virulence in Pseudomonas aeruginosa. J Microbiol Mol Biol Rev 2012:76: 46-65. Morohoshi T, et al. Phenazine antibiotic production and antifungal activity are regulated by multiple quorum-sensing systems in Pseudomonas chlororaphis subsp. aurantiaca StFRB508. J Biosci Bioengin 2013:116: 580-584. Wang Y, et al. Phenazine-1-carboxylic acid promotes bacterial biofilm development via ferrous iron acquisition. J Bacteriol 2011:193: 3606-3617. Wang Y, et al. Endogenous Phenazine Antibiotics Promote Anaerobic Survival of Pseudomonas aeruginosa via Extracellular Electron Transfer. J Bacteriol 2010:192: 365-369. Byers SA, et al. The antiproliferative agent MLN944 preferentially inhibits transcription. Mol Cancer Ther 2005:4: 1260-1267. Verborg W, et al. First-into-man phase I and pharmacokinetic study of XR5944.14, a novel agent with a unique mechanism of action. Br J Cancer 2007:97: 844-850. De Logu A, et al. Novel N-aryl- and N-heteryl phenazine-1-carboxamides as potential agents for the treatment of infections sustained by drug-resistant and multi-drug-resistant Mycobacterium tuberculosis. Int J Antimicrob Agents 2009:33: 223-239. Rewcastle GW, et al.Potential antitumor agents. 46. Structure-activity relationships for acridine monosubstituted derivatives of the antitumor agent N-[2-(dimethylamino)ethyl]-9-aminoacridine-4-carboxamide. J Med Chem 1987:30: 843-851. Borrero NV, et al. Phenazine antibiotic inspired discovery of potent bromophenazine antibacterial agents against Staphylococcus aureus and Staphylococcus epidermidis. Org Biomol Chem 2014:12: 881-886. Spicer JA, et al. Bis(phenazine-1-carboxamides): structure-activity relationships for a new class of dual topoisomerase I/II-directed anticancer drugs. J Med Chem 2000:43: 1350-1358. Gamage SA, et al. Structure-activity relationships for pyrido-, imidazo-, pyrazolo-, pyrazino-, and pyrrolophenazinecarboxamides as topoisomerase-targeted anticancer agents. J Med Chem 2002:45: 740-743. Yang Z, et al. The revised structure, total synthesis, and absolute configuration of streptophenazine A. Org Lett 2011:13: 5436-5439. Burkartmaier A and Mutschler E. Ueber die ägyptische Trona. Archiv der Pharmazie 2006:3: 228-231. Gaertner G, et al.Phenazines—II: The synthesis of aminophenazines. Tetrahedron 1962:8: 1105-1114.